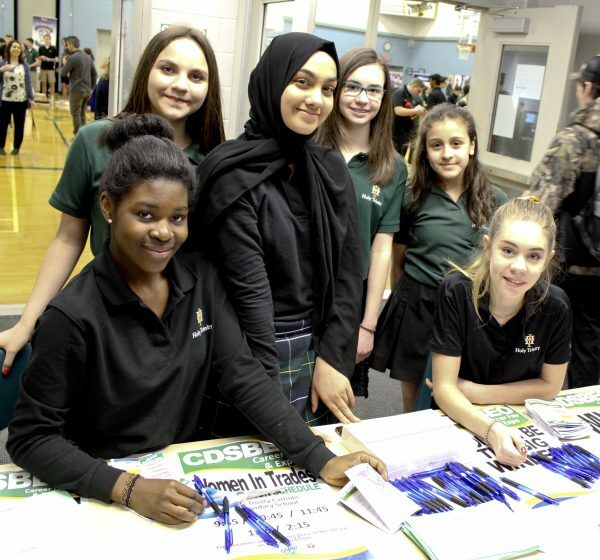 An abundance of career sectors were represented for CDSBEO intermediate and secondary students, who attended two career fairs hosted at Holy Trinity Catholic Secondary School (April 2) and St. Michael Catholic High School (April 3). Students from all ten CDSBEO secondary schools had the opportunity to visit one of the two events. The fairs aimed to help students learn about available career options, and to discuss opportunities and pathways with represented sectors. CDSBEO Apprenticeship Coordinator Dan Lortie, and CDSBEO Experiential Learning Consultant Liz McCormick organized the events in partnership with the host schools, which included catering provided by the St. Matthew CSS Hospitality Class (Cornwall) and the St. Michael CHS Hospitality Class (Kemptville). Many community partners attended, as well as organizations offering career support services. “It’s not just about exploring university or college. There is definitely a presence and promotion of post-secondary education, but there is also a good representation of other school to work, or school to apprenticeship options,” continued Lortie. 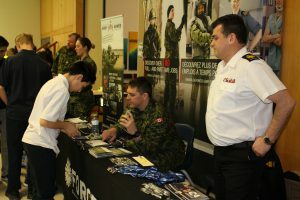 Organizations including the Royal Canadian Navy, Sun Life Financial, St. Lawrence College, Career Lab VR (Virtual Reality) Employment and Education Centre, and Carpenters Union (Local 93) were on site to speak to students. A group of students from Holy Trinity Catholic Secondary School host the Women in Trades table at the CDSBEO Career Fair in Cornwall. Left to right: Estelle Ngwa, Kyla White, Umaema Khan, Fiona Laplante, Melanie Kamn-Ramirez, Cristina De Ojinaga de Luque.